DashGo will offer 1 high-ranking Indie/Alternative artist from the February and March competitions with an innovative digital distribution and marketing package for a 3-month campaign in 2008. Winning artist will be selected by DashGo. 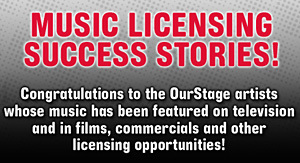 All high-ranking artists in the Indie/Alternative Channel in February and March are eligible for this prize; Prizes will be awarded according to the OurStage monthly competition terms and conditions; No additional expenses covered.